Former Calcutta High Court judge C S Karnan today walked free from Kolkata’s Presidency jail after completing a six- month jail term slapped on him after found guilty of contempt of court. A seven-judge bench of the Supreme Court, headed by then Chief Justice of India J S Khehar had on May 9 this year directed that Justice Karnan be arrested “forthwith”. This was after he declined to undergo medical tests to determine the state of his mental health which the judges felt required an examination. He was found guilty of contempt of court, judiciary and judicial process. "We are of the unanimous opinion that Justice C.S. Karnan has committed contempt of court, judiciary and judicial process of the gravest nature," then Chief Justice J S Khehar mentioned in the order. Karnan thus suffered the ignominy of being the first serving judge to be jailed. Supreme Court had taken suo motu (on its own motion) cognizance of Karnan’s misconduct in accusing members of the judiciary of nepotism, casteism and corruption when he served as a judge in the Madras high court. He was subsequently transferred to the Calcutta high court. A letter he wrote to the Prime Minister leveling several scandalous allegations including that of corruption against acting and retired Supreme Court and High Court judges was the final provocation for action against him. Karnan, who was evading arrest for more than a month after the court sentenced him to six months’ imprisonment for contempt of court, was arrested in Coimbatore after being on the run for 43 days. The arrest incidentally was made eight days after his tenure as a high court judge came to an end. The SC bench had earlier issued a bailable warrant against the judge to secure his presence before it in connection with the contempt case. 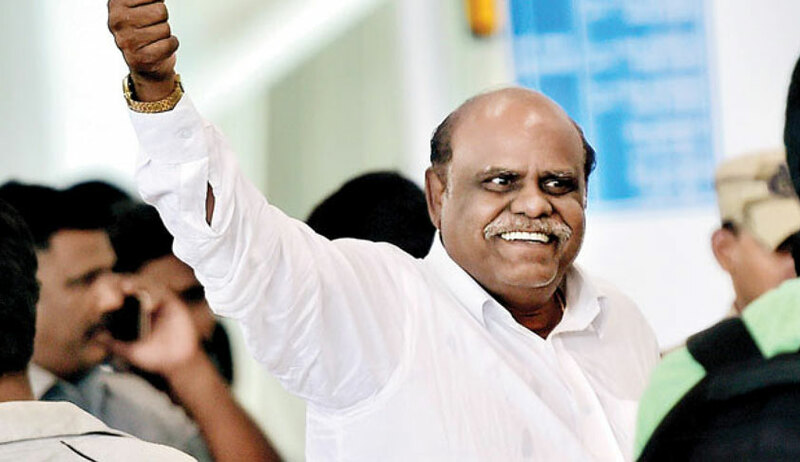 Karnan had appeared before the apex court on March 31, a first in the country's judicial history, and asked for restoration of his powers as a pre-condition for his re- appearance, but the plea was rejected.